He is half the height of a regular man but is due to be wed to a normal sized girl. Her parents are causing huge problems in the relationship in that they expect for him to cater to their every financial need and want. He brings them to Kumasi to live accommodate them and still they are not satisfied. His mother knows that the girl and her family are users and is determined to get rid of her. James is jobless and lives off his girlfriend who is working. His girlfriend’s parents are putting her under to pressure to marry and have a man lined up for her. She is determined to marry James but his unstable financial situation is not one that she can present to her parents. I found it funny how the little one’s mama called him chief. The elders would talk in Twi (I assume) and the younger ones would reply in English. I found this strange. There was never any swap. The subtitles were annoying because someone would talk for a good minute and then you would see only two words in the subtitles so it was clear than probably half of the dialogue was getting lost in translation. lwkmd…i had 2 laff at d 10% u gav dis movie…must b dat bad…hw hav u been…i haven't had a chance 2 watch movies in a while…been really crazy…i did manage 2 watch pass me your love…kinda funny…i hp 2 start watchin again more often soon…takia n keep doin a gud job!!! Hey Aegoli! Long time! I've been good. Good to see you back..
Oh lawd Nolly, 10%? You mean the movie is absolute rubbish, but the dvd's cover looks so interesting … lol. Ok, I get to keep my $10 in my pocket this time. Thanks for the heads up. The DVD cover is a lie. This was just made up. Its a mirage. I'm thinking it is two old movies sandwiched together. It makes no sense at all. complete ruubbiish, dats da first thing I sed. cuz dey got Majid paint all over n its actuallY van vicky or vicker der Lol. Total Wow of wat desperate peepl will do 4 xtra cash. Linda did you see this lie of a movie? They just pasted any yellow boy and thought noone would notice… ROBBISH! This two old twi movie put together. The part of Jackie, katawere and Janet Ackun is different from the part of Van Vicker and Tina. I don't know why they keep doing that. NF: please beware of "Heavy Heart" it's the same movie as "Somehwere in my Heart"
Hmmm my guess was right!!! ROBBISH!!! This is taking 419 to an even higher level! As for HEAVY HEART I have that piece of trash movie… It is only the part 3 to SOMEWHERE IN MY HEART!!! Can u imagine? Split into 2 parts and i think maybe an extra scene but u still don't find out about the twin stuff! SHOCKING! Like I said please watch some of the movies online to be sure before you purchase. Some of these movies are a total waste of time. I'm really sorry for your loss! lol. I prefer to watch on the big screen not ont he computer… Anyhow the name of the game is shift or swap, but this one I couldnt even sell cos it would be blatantly 419. And this one you would never find online cos its a lie! Its an illusion created by a greedy marketer! They got me twice cos this next movie I bought something about "angels" its in the flickr reel with Jackie on the cover, is the prequel or sequel to it! Na wa for my life!!! 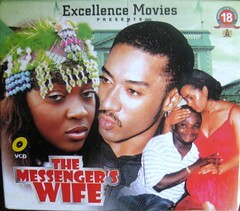 Nollywood Forever your review of this movie is on da money.I agree with you 110%..whatta waste of my time. @D0r33n Thanks for the heads up!